The new Honeywell Garrett G-Series turbo line is the most exciting product launch since the infamous Disco Potato. Everyone knows the GT-Series turbos were getting very long in the tooth. The GTX launch was an upgrade with updated compressor aero and new families of v-band, T3 divided, and v-band divided turbine housings. The GTX Gen2 launch was a further improvement in compressor flow along with new compressor housing castings. But overall, the foundation of the turbos had stayed the same for two decades. Enter, the G-Series, which is a clean sheet design to address and upgrade every aspect of the GT/GTX series turbos. 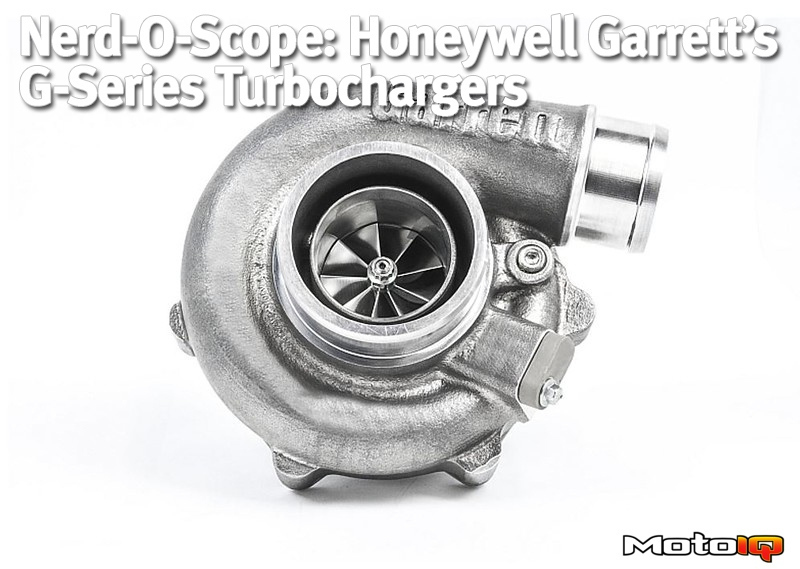 This is a true motorsports grade turbo for the masses. 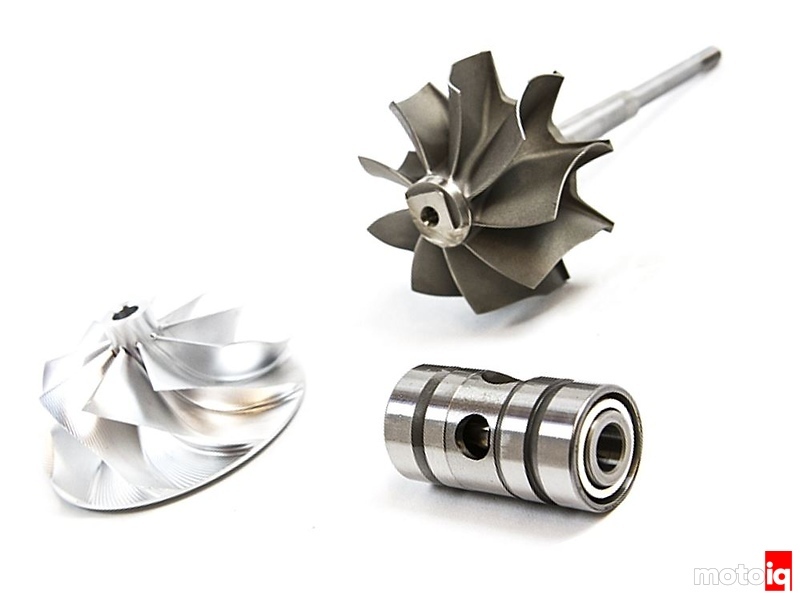 The updated parts which make the power are the compressor wheel, turbine wheel, and ball bearing. I’m 99.995% positive the ball bearing is full ceramic with metal cages. You can in fact see the metal cages here. Looking closely at the compressor wheel, you can see all the lines from the tool paths used to cut the wheel from forged billet on a 5-axis CNC. Sometimes, you’ll see the blades have a smooth finish instead of the many tool path lines. This is due to the wheel being machined by a process called flank milling, which uses the side of the cylindrical bit to do the machining. Flank milling is cheaper and faster, but the aero design of the blade can be compromised as the tool has to come in directly from the side. This G-Series compressor wheel is point milled where just the tip of the tool is used to cut the shapes. It takes longer and therefore costs more, but the blade aero geometry does not have to be compromised in performance. The new G-Series compressor aerodynamics are really, really impressive. The map on the left is a GTX Gen2 60mm diameter compressor wheel while the map is the right is the G-Series also in 60mm diameter. 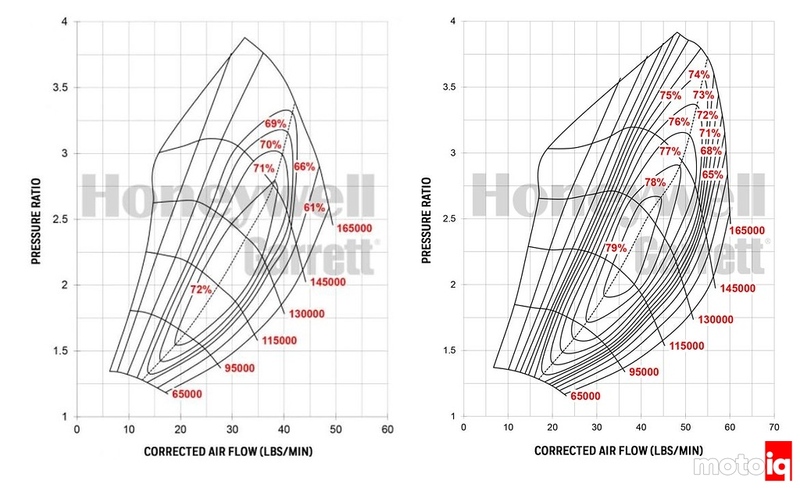 In going from GTX Gen1 to Gen2, peak efficiency of the compressor was compromised to gain more flow. The G-Series aerodynamics gained back that peak efficiency AND gained flow! Peak efficiency is 80%, which is pretty much as high as you’ll see short of Formula 1 turbos which use special and very expensive features. Keep in mind the GTX2860R Gen1 only had a peak efficiency of 77%. Also keep in mind that the smaller the compressor wheel, the lower the peak efficiency will be. This is due to the clearance between the wheel and housing being a larger percentage of the inducer area. Larger compressor wheels do run slightly larger clearances, but that clearance is a smaller percentage of the inducer area. 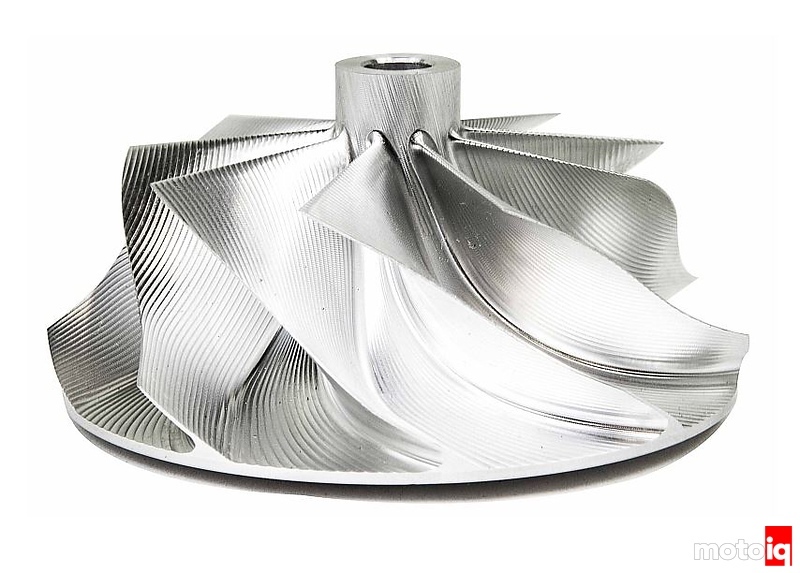 Therefore, larger wheels tend to have higher peak efficiency; this goes for turbine wheels too. As another reference, this new G-Series 60mm compressor flows more and has higher efficiency than the old school GT3071R. The left map is GTX Gen2 67mm diameter compressor and the right map is the G-Series 67mm compressor. Peak efficiency increased by 7pts (!!!) and flow increased 20%! 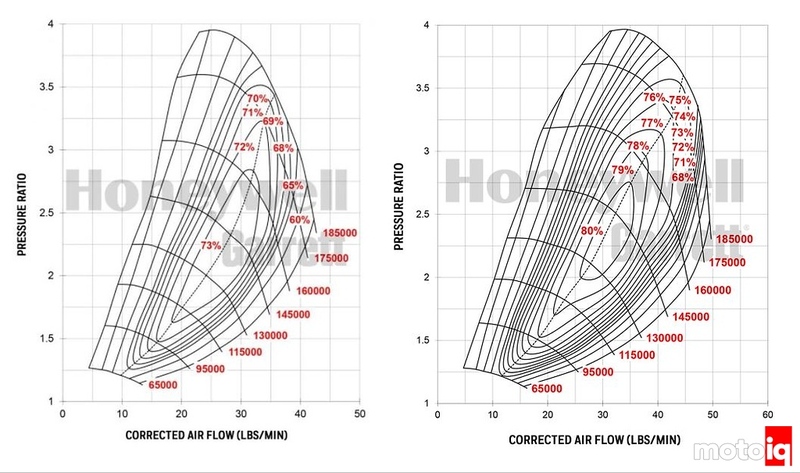 The efficiency increase translates into more power by reducing turbine power and therefore turbine back pressure.